Pauri is a tiny hill station in Pauri Garhwal District of Uttarakhand State. Also the head quarters of the Pauri Garhwal District and the Garhwal Division, it is situated in the northern slopes of Kandoliya Hill Ranges of middle Himalayas. Perched at an elevation of 1650 mt above the sea level, it commands an excellent views of surrounding Himalayan ranges from the upper ridge- starting from Chaukhamba to Nandaghunti Peaks. A quiet and calm hill station, Pauri became headquarters of the district Garhwal in 1840 A.D., and the Garhwal Division in 1969 A.D. Diverse in topography, pine and deodar trees, valleys, meandering rivers, silent forest and breezy wind from all around envelop Pauri. The Messmore College and other British era buildings etc still keeps the charm of the bygone period. Like other hillstation, Pauri too has Mall Road, Lower Bazaar and Upper Bazaar. It is situated 2 km from Pauri on the road to Lansdowne. Kandoliya Shiva Temple is a temple of the local deity, Kandoliya Devta, but the presiding deity here is Lord Shiva. Often referred as the Kandolia Devta Mandir by the locals, the temple is located in a thick forest. Kandolia Devta is the protector of Pauri and the surrounding villages. Inside the temple, there is a black stone idol of her. One gets stunning views of Himalayan peaks as one moves towards the temple. Also can enjoy the Oaks and Pine Trees, Deodars, Rhododendrons, Gangawarsyun Valley and the bird's eye view of the town below. Just below the Kandoliya Temple is a beautiful park known as Kandolia Children's Park A tranquil place filled with devoutness and serenity, Kandolia is quite famous for holding Asia's highest sports stadium. Located 4 km towards Lansdowne from Kandoliya is a tiny village Bubakhal. It has several minor roads snake across to the many villages on the slopes of the Kandoliya hills. The walk along this roads through oak and pine forest is really refreshing. Located 4 km from Pauri, this ridge overlooks the Idwal valley and Chaukhamba Peak. From here, one can get the fine view of the snowy Himalayan peaks. Behind the Chaukhamba lies Gangotri glacier , source of the river Ganga. The dense forest of Dwarikhal here is rich in a wide variety of flora. It is located Just below the Mall Road. It boasts a huge open air theatre with a stage where Ramlila and other public programmes are organised. The 8th century Shiva temple has established by Sankaracharya during his visit to Pauri. Dedicated to Lord Shiva, it has a small idol of Parvati, statue of Nandi and an ancient drum. The pillars have some intricate carving on them. The sanctum sanctorum contains an ancient Shivling above which a cooper kalash is suspended. There is a Sanskrit School near to this, runs by the temple authorities. The school follows the ancient guru-shishya paramapara. Students of the school participate in aartis that are held at 6.30 am and 7 pm every day. From Kyunkaleshwar Temple site, one can have the stunning views of the snow-clad peaks, Srinagar valley and other small places around Pauri. Located in the Buakhal area of Pauri, it is situated amdist a dense forest. The temple has an ancient idol of Nag Devta. A Nagdev Fair dedicated to Lord Hanunman is celebrated in this temple which attracts a large number of devotees. Located on the main Laxmi-Narayan Temple Road, this temple is one of Pauri’s oldest temples. The temple was destroyed and rebuilt it in the early 19th century, with an addition of a Shiv temple in1916 and the installation of a Hanuman idol in 1930. Below to this, there is a natural water source across the road. It is located at a distance 2.5 kms. from the town. 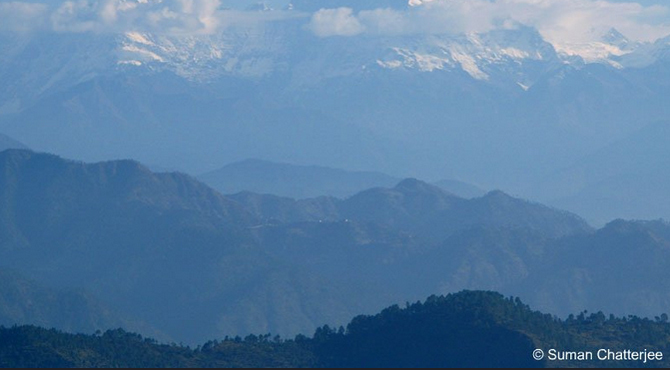 One of the highest points in Pauri, Ransi is a beautiful picnic spot. It has a Sports Stadium - the second highest stadium in Asia where games and tournaments are frequently organised. An ideal picnic spot, the stadium set amidst deodar trees.